When I sat down with Tom, he began asking me several questions about my thoughts on various aspects of the airline. He seemed genuinely interested in the responses but soon enough, it was my turn to ask the questions again. Tom struck me as being very thoughtful and measured with his answers. Echoing an earlier conversation with Mark Krolick, the issue of brand standards came up once again with Tom. Tom explained the problem this way. Every day, you can go out to O’Hare and see a 777 parked next to a regional jet. What should be the common onboard experience across those airplanes in a way that was financially viable for the airline? If you think this was a pie in the sky discussion, it wasn’t. I get the feeling Tom is a very precise person, and he proved it by explaining the four stages in making the brand standards reality in almost scientific detail. Here’s my summary. Assess where we are today – This is completely done for the onboard experience and is almost done for the ground experience. Define what the standards should be – This is almost entirely done. Express the standards in hundreds of product specs – This is about half done. Put an operational timeline to achieve full compliance – This will vary. Some things can be done very quickly while others may take years. After this, the conversation turned once again to the “Friendly Skies” campaign. He said many of the same things as Mark Krolick, but he gave a little more insight as well. The airline tested a ton of different taglines, and this was the clear winner. But the key for them was trying to pivot the tagline to mean something different than it used to. They couldn’t let the campaign make people think they were getting that ’70s style of service – white glove treatment, serving lobster, etc. I asked whether he was worried that regardless of how they position it, people will still have preconceived notions of what it should mean. He did not hesitate; he’s convinced they can make this shift. But what does it mean to be “user-friendly” anyway? It means, according to Tom, being a technology-enabled, information-driven, customer service organization. They need to provide information to people quickly and accurately. But they also need to be relevant, targeting travelers with what they want most. Tom mentioned Amazon a couple of times. He wants their merchandising efforts to look a lot like those of Amazon. It was now after 5, and I was exhausted. But there was one more meeting to have. I finished the day with Dave Hilfman, SVP of Worldwide Sales. When you meet Dave, there’s no mistaking that he’s in sales. He’s incredibly friendly with high energy and you immediately like the guy. Oh, and his office was full of holiday goodies. After having some cookies, it was time to talk shop. United’s sales efforts haven’t won them many fans over the last couple years. Despite the connection to Continental’s well-regarded sales team (from where Dave came), the poor operation and tech problems really started to hamper the sales team’s ability to do the job at hand. As things improve operationally for the airline, the sales team’s effectiveness improves as well. So what exactly are they doing to right the ship? Getting SHARES (their reservation system) to function properly is a big part of that. Dave said they “feel a lot better” today about that piece of it. But there are other things within the organization that they’re doing to improve their performance as well. One thing that corporate accounts won’t like, however, is that they are going to start better enforcing compliance with terms of their agreements. After the merger, they loosened things up but now they’re going to start coming down harder on contracted companies that decide to spread their business around despite their promises. I asked Dave what corporate accounts tell him they hate the most – some kind of policy or procedure that makes their lives miserable. In general, Dave said the biggest issue is that corporate accounts don’t like change fees (like everyone else). So providing waivers for that is a tool they can use in crafting their corporate agreements. The conversation finished up with a little talk about New York. Delta has been very vocal about all the share of corporate business it’s taking in New York, so what did United think? Dave said they aren’t seeing any loss of business at all. And now they’re going to get more aggressive. They’ve spent the last year really trying to service accounts and keep them happy when things were going bad. Now they’re moving into selling mode. And with that, we were done… so I thought. On the way out of the building, I went and saw a couple of the Customer Experience folks. I also had the chance to meet a few of the people on the social media team, those people who respond to all our tweets every day. Finally, as we approached 6, my day was done. I was exhausted, but I immediately perked up once I felt the sting of the cold air as I left the building. Been a lot of information about United, but extremely interesting to hear all of this from someone who has enough subject matter knowledge that they’ll be given proper answers to questions from airline staff. Probably takes up a lot of time for you to do something like this (or with Korean earlier this year), but makes for some worthwhile reading. Perhaps we could have another one of these on a different airline (or an airport) in the spring ? David – I was actually going to make this part of the topic of the week tomorrow – see how much people like these. I do enjoy these kinds of trips but they are completely and totally exhausting. I can’t do them a ton, but I can do them at least a couple times a year if the airlines are willing. Very interesting posts, but i have to wonder about Dave Hilfman’s honesty about not losing any business in NY. Maybe head-in-the-sand syndrome? BOS Flyer – Well if United really isn’t losing business, it means American has been bleeding terribly. CF-Great summary of what seems like an exhausting but very fun day. Thanks a lot for sharing. It is interesting learn of the perspectives of the folks in the Willis Tower. Tom O’Toole is giving a very narrow response when he discusses what commonality there should be in brand standards between a 777 and a regional jet. No restroom for FC on CRJ700, no working sinks on E135/145 ( handi-wipes a brand standard?) and inconsistent boarding process where groups 1&2 are sometimes called at one time instead of sequentially. On mainline, taking Tom’s 777 as an example, there is no consistency between legacy CO and legacy UA interiors. And how’s that commitment to channel 9 coming as they rip out entertainment on A320’s? 50 seaters have E+. The bulkhead seats and row 18 are sold as E+. The common reason why sinks are not working is because a routine test revealed a particular water tank was contaminated with bacteria. The tank must be drained and treated therefore hand sanitizer wipes are placed in the lav. I haven’t flown United in years but one airline I have flown a lot recently that does this well is Air Canada. Their CRJ’s do have the same on board (IFE, etc.) product as their mainline metal does. Any US domestic doing that? None that I know of and I was very impressed. I fly Delta a lot and it’s a crap shoot on what you get if you’re flying a 757. Granted this has to do with planes from pre-merger, same deal as United. To me personally it’s something that should be a standard across all aircraft ASAP. If you don’t want PTV’s, fine, just make it consistent. International and business class is a bit different but in coach there shouldn’t be a lick of difference from a ERJ to a 320 to a 757 to a 777. All the work I’ve done in branding across a portfolio the #1 rule is always consistency, consistency, consistency. Airlines don’t seem to have a clue, but the passenger sitting in the seat sure sees it. Wonder why people love Southwest? Bingo. A – I don’t mind the idea that 50 seaters and under can look a lot different than those with more than 50 seats… if they use those airplanes right. Delta is a good example. They’re creating a product standard of Economy/Economy Comfort/Biz or First plus wifi on every airplane with more than 50 seats. IFE isn’t standard and that is annoying. But it’s hard to do IFE right when you’re dealing with a motley, legacy fleet. For 50 and under (including props, if any), keep them on short routes and they are more of the true regional operator ideal. I can see UA not seeing much or any business traffic vanish in the NYC area as CO was big in that area already and with the bigger reach of UA to the in the west and in the pacific it could have only helped. It’s AA that needs to worry about the large home turf advanatage of UA/DL and B6 now. Faster, No Hassle flights with good food and great crew. 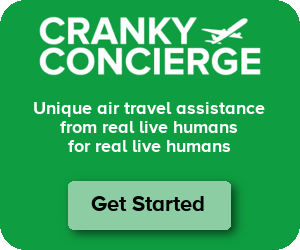 Great series Cranky and I look forward to something similar with other airlines, and the same line of questioning, so that a comparison from the corporate aspect can be drawn. I think that United are trying, and in my opinion appear to be going in the right direction, but as we know, we cant please everyone! I think the consistency issue is very important, so I’m glad it’s on United’s radar screen. Delta did a great job in the NW merger fairly quickly developing and executing against brand standards (although you can still tell whether you’re on a pre-merger NWA plane when you look at things like the seat row numbers). I was amazed by the attention to detail with Delta’s transition; it seems they hired a person to spot every instance of every NWA logo in the old NWA hubs. United has a long way to go–even as the main signage has been updated at hubs, there’s still plenty of little tulips around. United’s interiors are also very inconsitent, not only in product available, but look. I would also encourage United to think about how its brand standard compares to others. A major difference I’ve experienced is regional jet first class. DL and AA are offering glassware and (on segments of appropriate length) meals. United is offering drinks in plastic cups and snack boxes. Great post, as always. “Exhausting,” I’m sure it was, but my guess is that for you, it was a pleasure. At least it was a pleasure for me to read. “Friendly” is one thing for one person, and another thing for another. [A brilliant statement by me, isn’t it!] Anyway, for me, hearing Gershwin’s “Rhopsody in Blue” is powerful. It makes me think of all the good of UA, pushing all the bad to the back of my mind. This is a tough industry for us customers to appreciate. As an elite on UA, it’s very difficult to compare UA with the other legacies. I seldom don;t use, or don’t use the others enough to critique them. Of course, I do fly WN JetBlue on occasion and when I do, I often sit there thinking, now if they can figure this or that out, why can’t UA? Of course, I often sit there thinking, well, what were they thinking? UA has figured this out. To me, airlines simply get too big and lose the ability to be “friendly.” All things to all people, but not particularly good to anyone. This is where UA is in too many situations. But, what do I know? OK, off to Target to deal with a terrifically, well run company…say what? Thanks Bret. I enjoyed reading this brief series. Next week (or whenever) it would be fun to see one more post on UAL, the questions not asked – or the ones asked but not answered. How about asking EMPLOYEES (especially pre-merger United employees with decades of experience) what they think…..?? Funny that the old days of lobster and white glove service is mentioned in your article. I still say we should never have deregulated the airlines, now unless you buy a first class ticket you get shoehorned into your seat and get bupkis for supper unless you pay an outrageous price. Yes, you have IFE and Wi-Fi but as for the rest of the coach experience it really is crappy. Even first class pales to what the airplane experience was like in 1970. This argument pops up all the time – I’m sure that nobody who knows the industry cares to even react to it, but frankly, pre-deregulation flying was expensive and a luxury. While longing for the days past is a natural human fallback, this amazing situation with options and customer-centric approach is something I’d never give up. Looks like Ogi beat me to it. Hate to break it to you, mharris127 but you would be paying first class prices today for every seat if the industry was still regulated. Look at inflation-adjusted ticket prices and fares are incredibly cheap today with more choice available. You think today’s prices are “outrageous”? Only if you mean outrageously low compared to what they would be. The explanation of the revival of the “Friendly Skies” campaign certainly brings a welcome, different perspective that I hadn’t considered before, but I remain skeptical that this will actually work. While I understand Tom’s nuance that the goal of the ads is to portray the airline as “user-friendly”, to me, the content of the ads, including the use of “Rhapsody in Blue” and the orchestra playing, continues to give the impression of a premium airline experience, which I know I’m not going to get in my middle seat in Economy Minus. Yes, I get that these ads are targeted at business travelers, but with more and more of these elite business travelers stuck in those middle seats in the back of Economy Minus due to the cutbacks on upgrades, I see this as an even greater risk of inflaming and alienating the exact market that they’re targeting. I completely agree. I find the “user-friendly” ads insulting and inflamatory every time I have a bad United experience (which is most of my flights the past year), especially in Houston which seems particularly bad. I’m a preimium customer and I had a gate agent lie to me that my plane had left the gate (it hadn’t but they had closed the boarding door) and another gate agent give away the last four upgrades to non-revenue airline employees. I qualified elite again this year on United but will probably go back to American or Delta as my main airline in 2014.